An Aberdeen care home has been relaunched with a change of name to reflect its new care team. Meallmore Ltd’s Sunnybank Care Home has been renamed as Bayview Care Home. Arlene Campbell, head of the home’s new senior management team, said: “I’m passionate about ensuring the wishes of our residents and their loved ones are heard so that my team can really provide person centred care. 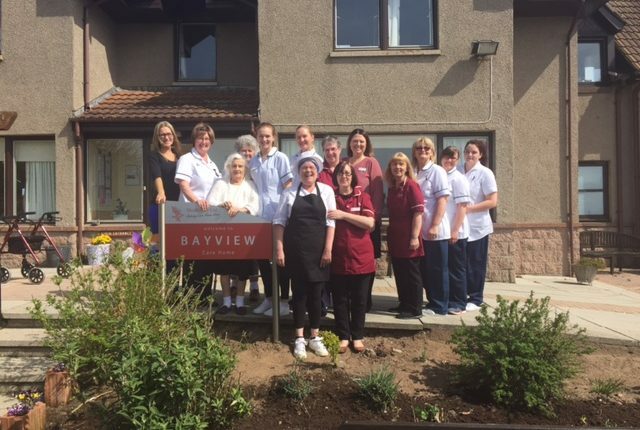 “It’s important to me to be a positive role model, which is why one of our major priorities at Bayview is ensuring that all of our staff are fully supported in terms of learning and development so they can deliver an excellent standard of care. Arlene has worked with the company for some time and brings over 20 years of experience in nursing care. She has already been instrumental in enhancing the services provided and establishing the care home as part of the local community. Following a successful recruitment drive at the end of last year, Arlene has also welcomed a number of new highly qualified, experienced and committed nurses, senior care workers, care and catering staff. A major focus has been on investing in new and existing staff through the delivery of extensive training and development. The care team is encouraged and supported to achieve SVQ qualifications and participate in internal company development programmes, all of which is currently reflected in the quality of care on offer. Bayview is committed to exceeding the new National Care Standards and has its own quality assurance framework and dementia strategy.